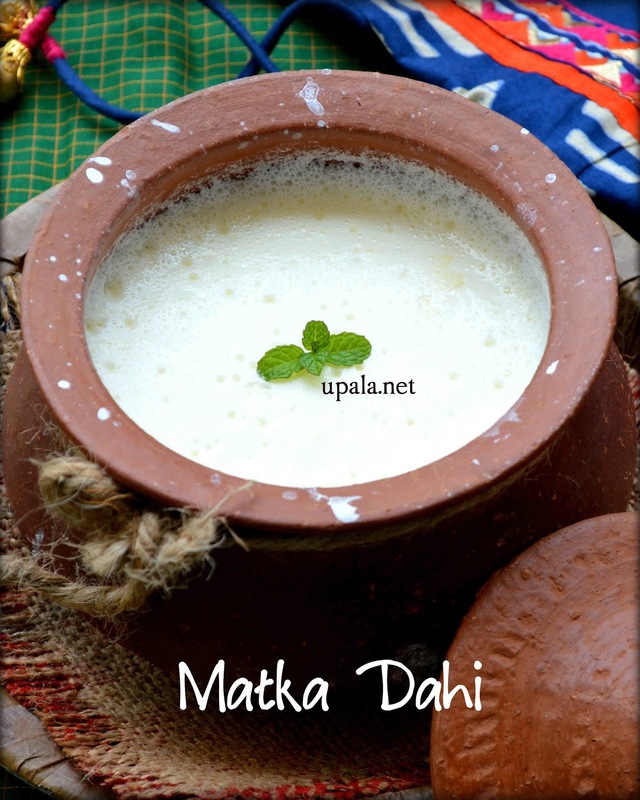 Upala: How to make thick Curd/Yogurt/Dahi in a clay pot? How to make thick Curd/Yogurt/Dahi in a clay pot? Curd/Yogurt is one of the essentials in all the Indian households. It is a natural probiotic that helps to stimulate enzymes as well as the processes to keep our digestive process intact. The versatility of curd is appreciated in Indian cooking and hence, it has been used in both sweet as well as salt recipes. 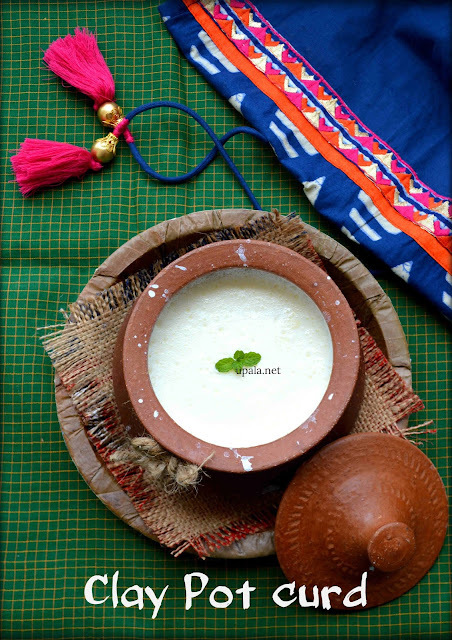 Be it a boondhi raita or a sweet lassi, you are sure to relish it. Isn't it? Why do we use a clay pot to make curd? Though Clay/Mud pot may be optional to use for curd setting, you need to note that it is one of the ancient cookwares that is completely harmless to our health. Unlike other modern cookware, which is sure to leave some toxins in the food, mud pots are made of eco-friendly and 100 percent toxin-free materials. Go for an unglazed mud pot and enjoy its full benefits. Try Madka curd/Clay pot curd once and see how thick and creamy curd can be made so easily at home. How to clean a curd pot? Since this is a clay pot, you might think that there will be a big curing process to be followed before using it. No worries, you are not doing any curing process at all. Generally, the curing process is done to avoid getting crack in mud vessels when we cook it on a direct flame. Unlike the ones that we use on a stove top to cook the food, this pot is used only for making the curd and is not going to sit on a hot stove. So it saves your curing time but it still requires cleaning process to be followed. Once you buy a new clay pot for Dahi, wash it in plain water for 2-3 times. In fact, you can soak this pot for half an hour in clean water and use a soft sponge to wipe off any mud. Then, leave it to sundry. Once it is dried thoroughly, you can start using it. "Strictly say no to detergent"
When you wash the clay pot after all your curd is finished, never use detergent to wash it and use only plain water. If there are stubborn stains, sprinkle some salt and use a brush to scrub them off. Once done, leave it to dry in sun. If you are buying your set of clay/mud cookwares for cooking, then you need to do the curing process which I have already posted a detailed procedure that explains all the steps involved clearly to help the newbies. 1) Boil milk in a pan and leave it to reach the lukewarm stage. 2) Take the cleaned Clay pot and pour the milk into it. 3) Add 1 tablespoon of curd and churn well with a whipper. The amount of curd being added to milk varies according to the climate of your place. It needs more starter if you are in cool place and less for a warm place. 4) Close the lid and place it in a warm place till the curd is set. 1) Once you add the curd and set the milk aside, do not disturb the pot as this might hinder the curd setting process. 2) The time taken for this Curd setting process varies as per the temperature of your place. If you are in located in a warm place it might get set faster than it the time it usually takes in a cooler place. Here in Bangalore, it takes more time so I keep this pot in a place where I get sunlight to speed up the setting process. 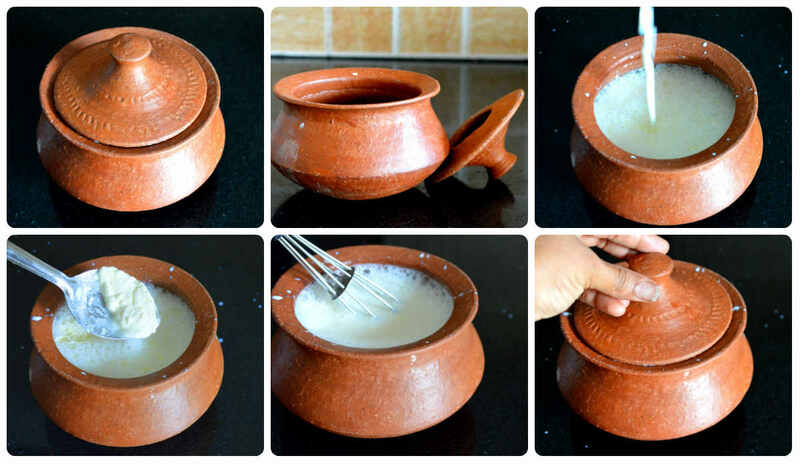 3) You can refrigerate the curd with clay pot once it is ready. If you let it stay outside for a longer time then the curd might turn sour in taste. Hello Harini: I was especially taken up with your advocating a mud pot to prepare yoghurt. Searching your website, I could not find out where you live. I live in Southern California. So my question is: where in California or the USA can I buy a mud pot? I would like to buy both the cured (to cook) and the uncured versions. Thanks, Dido. Thanks for visiting my food blog. I am not sure about the store that sells mud pot but you can try online. 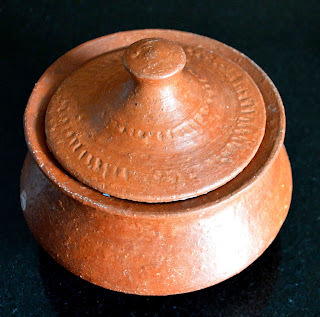 When I tried searching for "curd clay pot online" in google, it poped up with so many websites selling earthen ware and one such is Amazon too. I hope this information helps you. Also, there will be no cured version sold as it is the process that you need to do at home.